Why can't kindness and benevolence be an all-year deal? Some people only seem to be caring only when it's Holidays time like it is now. At least it is better than being respectful for some time while being a heartless soul the rest of the year. Some people seem to only care about other people just because it's the Holiday season. No... try being respectful to others all year 'round. It doesn't mean you have to do anything like prepare impressive meals to homeless people all the time or anything, but doing simple things to help others feel welcomed and respected will suffice. I have always felt that being kind and benevolent to people helps us in turn feel better about ourselves. It is a feeling of empowerment and of giving back to others. You don't have to know any specific person to care about or do something special for. As long as a certain individual is appreciative and respectful, you know you're doing something positive to counteract the negatives in our society. The only exception in all of this is if the people you are trying to help either don't appreciate or don't care about getting help. In these situations, at least you know you were generous enough to offer your services. It is just too bad some people simply don't care. The main message I'm trying to get across is that it doesn't have to be the Holiday season to be thankful or to be benevolent and kind. Not everyone is warranting of being treated with kindness or with charitable acts, but at least try to make yourself a better person by being kind and benevolent to others. You don't need Thanksgiving, Christmas, or any other holiday to be reminded of any acts of kindness. Kindness and benevolence are to be enjoyed and practiced every day of the year. Our society is too negative to where we almost need to be reminded that chivalry and kindness still exist in this world even in the wake of some of the most depressing and disgusting acts committed by others. We almost need to be reminded people still care. Let's try making a difference in others' lives instead of always seeing certain people as threats that must be defeated as soon as possible. We can make society better one kind and respectful act at a time. You don't have to be any sort of crusader or be part of some group to enhance the lives of others. Simply saying hello to someone or complimenting one's looks is enough to draw a smile to most people and make them feel appreciated. Just remember to be sincere and respectful as you offer your kindness to others. That, more than anything, is most important in trying to enhance your image and feel respectful. The first three sentences were taken from an actual post I made to the Wall of my Facebook profile page. I simply took those three sentences and expanded upon my thoughts. So this post is basically a continuation of something I posted on Facebook. I have more special things to post about online than come up with Internet memes or whatever. Why do you think some people only seem to be kind and benevolent only because it is Thanksgiving and/or Christmas? What do you think about kindness and benevolence being an all-year, every day concept rather than only this be focused on around Holiday season? 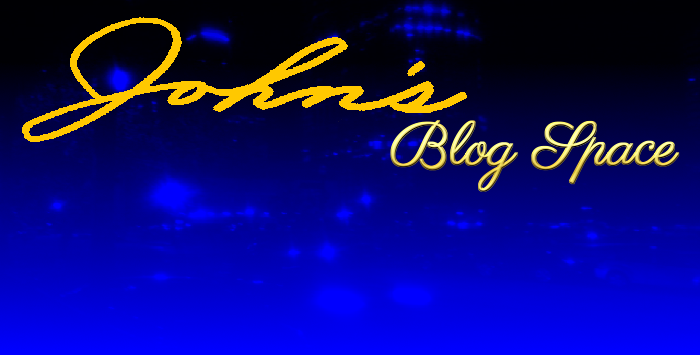 Thank you very much for visiting "John's Blog Space!" For more material and to keep up with the latest posts of mine across all of my blogs, make sure you Subscribe and Follow. Thank you for reading! Hi John! I just wanted to drop a note and say hello since you've been too kind in keeping up with my lookbook posts. I completely agree that kindness and respect should be a constant effort, not just a holiday thing. Our society really is too caught up in self-gain, and often times we forget about those around us. I've always found it ironic that Black Friday is right after Thanksgiving--we say we're grateful for all we have then go buy more. It really bothers me that now the shopping extends into Thanksgiving night. Anyways, just a tangent haha. Keep doing what you're doing, and I hope to be back to converse regularly with all my blogging friends soon!